80 days. Cucurbita moschata. Open Pollinated. Plant produces high yields of 36" long tan zucchini squash. Excellent steamed, grilled, or used fresh in salads. Excellent choice for home gardens. A variety from Italy. 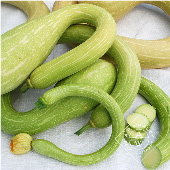 A summer squash variety.